Use the Service menu to send requests to the services made available by the Tool Consumer. The last request made for the currently selected service can be viewed via the View menu. Alternatively, the Test Tool Provider can be opened directly in a browser and the Tool Consumer credentials and service endpoints entered manually. Use this menu to change the page which is displayed. This tab is available when the Test Tool Provider is opened by a ContentItemSelectionRequest message. It allows pre-defined content-items to be selected for return to the Tool Consumer, or for a bespoke item to be created. A drop-down menu of the services supported by the Test Tool Provider; any not made available by the Tool Consumer will be disabled. Select a service to send requests to the Tool Consumer. Used to refresh the system, clearing any changes made since the last save. Used to update the system when the Save button is disabled. This will refresh the system to the original values as when the Test Tool Provider was opened. This will clear the system and reset all values to their defaults as if the Test Tool Provider had been opened directly (not via a Tool Consumer). This tab summarises the message received which opened the system. This section identifies the message type, security profile used and whether the signature was verified. If the Tool Consumer provided a return URL, links are also displayed which allow this link to be followed with all combinations of return message and log entry. 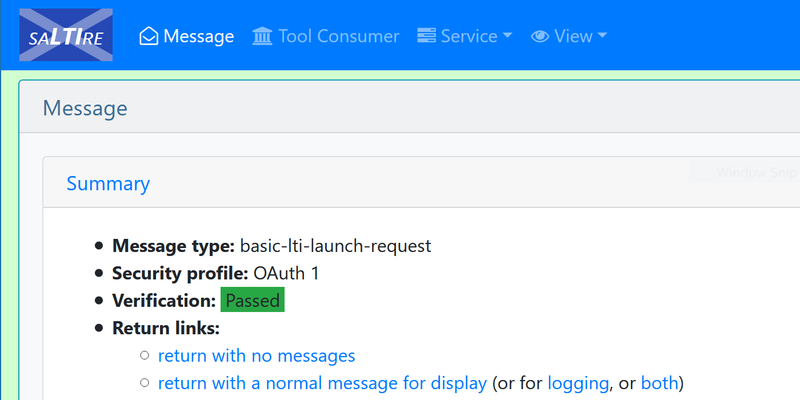 A list of services supported by the Test Tool Consumer is displayed with those made available in the message received from the Tool Consumer marked with a tick; all others are marked with a cross. All available services can be accessed directly by clicking on their name. This tab displays the credentials and security profile used for connections with the Tool Consumer. These values are used when sending service requests to the Tool Consumer. Changing them allows invalid requests to be tested. If a Tool Consumer Profile has been obtained it will be also be displayed on this tab. This tab is displayed for ContentItemSelectionRequest messages. You can use it to select sample content-item(s) to be returned to the Tool Consumer, or to create a bespoke item. Messages to be returned with the items can also be added. This menu lists all the services supported by the Test Tool Provider; those which have not been made available by the Tool Consumer will be disabled. Selecting a service from the menu will display the settings relevant to its use, including the endpoint(s). The settings page can be used to send requests to the Tool Consumer; use the View menu (see below) to inspect the request made and response received. This menu provides access to the last message sent to an endpoint for the currently selected service. A tab is displayed for the each of the request and response elements. try using the Clear session option from the Save menu to reset the data; and have the Tool Consumer send its message again. When trying to open the Test Tool Provider within an iframe and the page is blank, try opening it in a new browser window/tab to see if that works. If it does check that both the Tool Consumer and the Tool Provider are using the same schema (e.g. both http or both https) and check the security settings in the browser for cross-origin resource sharing (CORS). when using a JWT-based security profile ensure that you have first requested an access token.